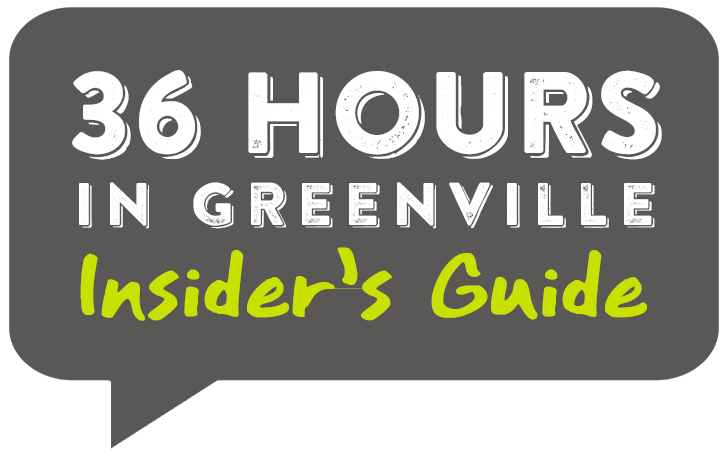 When you visit Greenville, you should feel like an insider, too (and never pay $50 for a sandwich). So here’s what I’d do on a weekend getaway if I were visiting my own town. First, I’d make downtown Greenville an epicenter for the weekend. I’d check in to Hampton Inn & Suites Downtown RiverPlace. In addition to its convenient location, we love it for the balcony views overlooking the Reedy River. Once you’re checked in, start checking out the downtown dining. With only 36 hours in the city, there’s so little time to fit in So. Much. Deliciousness. An incredible 100+ restaurants are within 10 blocks along and off Main Street. A mere 20 feet from Hampton Inn’s front door is The Lazy Goat. A can’t-go-wrong suggestion is anything with goat cheese. Alternatively, you could take a short walk to Soby’s New South Cuisine (don’t miss the shrimp and grits), Table 301 Catering & Kitchen (salads, any of them), and NOSE DIVE (love the veggie plate)—all part of the same locally owned restaurant group. If the weather is good, always choose to eat outside and watch families, couples, old and young as they stroll Main Street. Completely sated, you might take a little stroll down to Falls Park on the Reedy. Just about everyone in Greenville calls Falls Park a favorite place to while away a few hours. In almost any weather, the park teems with children, couples, families, teenagers, bicyclists, joggers and picnickers. It feels like Greenville’s backyard. You’ll want to walk across Liberty Bridge to soak in the lovely view of the Reedy River Falls. The bridge fascinates my engineer-filled family because it’s supported by a single suspension cable—the only one of its kind in the Western Hemisphere. Up and at ’em on Saturday. The season will determine the agenda for today. If it is anytime from May through October, you’ll want to amble through the TD Saturday Market with its fresh pastries, flowers, vegetables, fruits and wonderful handcrafted goods. If you aren’t yet caffeinated, stroll up to Methodical Coffee for the serious handcrafted coffee experience. For the quirky, hometown coffeehouse vibe, head to Coffee Underground. For a full breakfast, cross ONE City Plaza at Main and Coffee streets, look left and dive into Caviar & Bananas. Delicious, fresh and the ideal place to order your avocado and toast, grab a table on the plaza on a glorious Saturday morning and watch the stream of locals and visitors. After breakfast, shop your way back down Main Street through galleries, boutiques and stores including Mast General Store, O.P. Taylor’s toys and Southern Tide clothing. As you walk, keep your eyes open for Mice on Main. Nine true-to-life-sized bronze mice are tucked along Main Street from the Westin Poinsett to the Hyatt Regency. By now, you’ve noticed the number of bicycles in town. One of our family’s favorite places is actually a 21-mile greenway that runs right through downtown and is exclusively for non-motorized use: the Greenville Health System (GHS) Swamp Rabbit Trail. It’s full of runners, walkers and cyclists of all levels. If you don’t have a bike, no worries. You can rent bikes all over town or head out on foot. However you get on the trail, jump on now because you’re going to have lunch at one of my favorite spots: Swamp Rabbit Cafe and Grocery. You’ll scarcely work up a sweat before you encounter Swamp Rabbit Cafe and Grocery (and bakery, pizza restaurant, butchery, family gathering spot and food hub) at mile marker 31.3. All the food in the cafe and grocery store are locally sourced and super fresh. Especially on Saturdays, the place feels like a family hub. Children swarm the playground, strangers share long tables outside for wood-fired pizzas and craft beers, and customers take home fresh fruits, veggies, sourdough bread, cheese and hormone-free local beef. I cannot say enough about the red lentil soup served with a side of house-made sourdough bread. Especially in winter, it will warm the cockles of your heart—whatever those are. If you are lucky enough to visit Greenville during one of the dozens of excuses we use to shut down Main Street and have a party (aka festival), by all means spend the day roaming downtown. My hands-down favorite event is Artisphere, a three-day spring event bringing artists from across the country to demonstrate, display and sell their creations. Greenville residents also enjoy Euphoria and Fall for Greenville to celebrate local and exotic flavors. A trip planned around any of these events will be well spent. No festival during your visit? Take in the completely wonderful Greenville County Museum of Art. It’s just the right size and is world-class with a permanent collection including works by Jasper Johns, Andrew Wyeth and regionals artists as well as various special exhibits. Bonus: it’s free. For the evening, I’d suggest catching a show at the Peace Center. You’ll get a wonderful performance, affordable tickets and enjoy a theater that lets you see and hear every word. I’ve seen performances from Itzhak Perlman to “Phantom of the Opera” and have never been disappointed. The weekend is almost over and there are still plenty of gems you haven’t discovered: the Greenville Zoo, a Greenville Drive baseball game, a trolley ride on Main Street or the art and food of the hip Village of West Greenville. Obviously, a weekend is just not enough time. Before you go, grab brunch at Biscuit Head, where items including brisket, fried chicken and catfish are a side to the biscuits. That ought to leave you with an excellent—and buttery—taste in your mouth for Greenville. Yeah, there’s still more to do in Greenville—go ahead and explore.